Fantasy football sleeper picks are hard to come by because of all the coverage devoted to fantasy sports now a days, but I have one for you to keep your eye on. There are two running backs with the Cowboys that we should keep our eyes on and they are Gus Johnson and Lache Seastrunk. 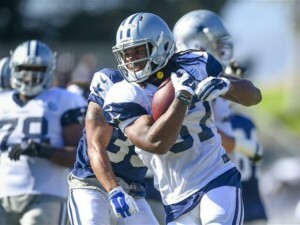 First of all it will be hard for Johnson and Seastrunk to make the Cowboys 53 man roster. Already on the roster are Darren McFadden, Joseph Randle, and Lance Dunbar. So there is no doubt they will have to beat out one of these guys to get on the 53 man roster. Both of these two running backs are better all around backs than Lance Dunbar and one of them will have to beat him out to make the 53 man roster and the other one will probably make the practice squad if another team doesn't pick them up. 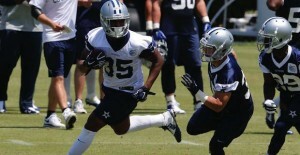 Lache Seastrunk signed by the Cowboys this offseason hopes to be in the running back rotation. Keep an eye on him for your fantasy team. On June 8th the Cowboys released rookie Synjyn Days and signed Lache Seastrunk. Seastrunk was a standout running back for Baylor in 2012 and 2013. He racked up 2,189 total yards and 18 touchdowns in his two seasons with the Bears. Lache Seastrunk is a very intriguing back. At 6.0 and 210 pounds he has the prototype size for an NFL running back and he has prototype speed as well with a 4.46 40 time. The Washington Redskins selected Seastrunk in the sixth round of the 2014 NFL Draft at No. 186 overall, but he did not make their final roster at the end of the preseason. He spent two weeks on the Carolina Panthers’ practice squad before he was ultimately released. He signed to the Titans’ practice squad in October, and he stayed with Tennessee up until his release. In their last preseason game versus the Tampa Bay Buccaneers, Seastrunk took a screen pass 80 yards for a touchdown. He showed great hands and great speed. Undrafted rookie Gus Johnson was signed by the Cowboys this week. Keep an eye on him as a sleeper. On Tuesday, the Dallas Cowboys waived running back Ryan Williams and signed undrafted rookie free agent running back Gus Johnson, from Stephen F. Austin University. Before this year's NFL Draft I had Johnson ranked as the 8th best running back. Check out my article: Top 10 NFL Draft Prospects at Running Back with Video. The one weakness he has that probably led to him going undrafted was his 4.65 40 yard dash time. At his pro day he did lower that time to 4.62, but that is still considered slow for an NFL running back. Prototype speed for an NFL running back is in the 4.4 range. But he also showed at the NFL Combine that he is more quick than fast. He ran a 10th ranked 20 yard shuttle time and ran a 36th ranked 40 yard dash. The 20 yard shuttle run is more about being quick and changing direction. He showed he is very good at that. But, he also showed that he does not have great top end speed. That is something he needs to work on. Joseph Randle started training camp this week as the starter with McFadden as the backup. Those two will make the team for sure, but there is no way that McFadden is gonna be healthy all 16 games. So they will have to have a 3rd running back on the 53 man roster for sure. The Cowboys coaching staff seems to really like Lance Dunbar, but I am not seeing what they see. He is way undersized at 5.8 195 pounds, but he does have prototype speed being clocked at 4.47 in the 40 yard dash. I have read where the coaches have been real happy with his blitz pickup so far in camp, which is surprising with his small size. I do not think he will be able to hold up during the season facing 240 pound linebackers trying to take Tony Romo's head off. Another thing that everyone seems to forget is that it wasn't just the Cowboys great offensive line that let DeMarco Murray rush for all those yards. According to Pro Football Focus, Murray led the NFL in yards after contact with 998. So, of Murray's 1,845 yards he rushed for during the regular season if he wasn't strong enough to break a tackle he would have only rushed for 847 yards, not very good. So that tells me for the next Cowboys running back to have some success, he must have good size and be able to break some tackles. McFadden, Randle, Seastrunk, and Johnson fit this mold. As I stated earlier there is no way in my mind that McFadden will play in all 16 games. He has a history of getting nagging injuries that keep him sidelined. Last season was the only season in his 7 year career so far that he played in all 16 games. Before last year the most games he had played in a season was 13 games. So that is at least 3 games where you have to have another running back for him. Randle is pretty much an unproven commodity. He has been with the Cowboys for 2 years, but still has not rushed for over 100 yards in a game. This past season he only had one game that he had double digit carries and it was in a blow out against the Indianapolis Colts. He rushed 13 times for only 37 yards, averaging only 2.8 yards per carry and that was behind this great Dallas line. Randle did average 6.7 yards per carry, but it is a lot harder running the ball when you are the featured back instead of being the change of speed back. Defenses don't game plan all week to take away the runs you do best. Another question about Randle is his behavior off the field. He has had a few incidents off the field and you have to question if you can put all your faith and trust in him. He has to become more mature to be the lead back that DeMarco Murray was. The Cowboys coaching staff should have a true running back competition and give Johnson and Seastrunk a legitimate shot at making the team and starting. The worst thing they can do is just hand the top three jobs to McFadden, Randle, and Dunbar. Remember the names Gus Johnson and Lache Seastrunk this season.